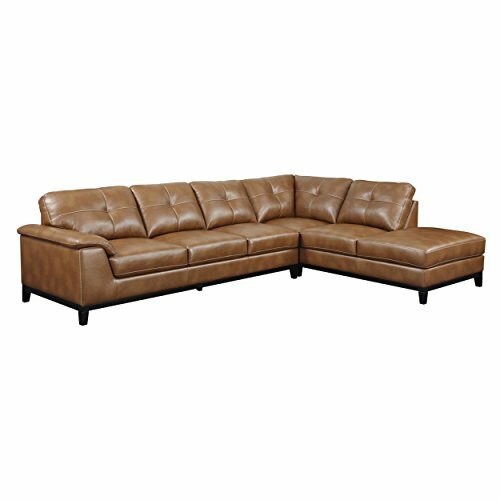 The “Marquis” is a transitional two-piece sectional that can be ordered as a six seating configuration, a 5 seating option for smaller spaces as well as a sofa/loveseat. With a beautiful solid wood front rail base that has a full return all along the front, sides and outside back so that it can dramatically “float in the center of a great room, or nestle into a seating corner of the home. Attached seats and backs make for easy maintenance and our sewing detail is reminiscent of popular trends today of luggage contrast stitching for added dimension and texture. Generously scaled arms are perfect for arm or head resting when needed, with our seat construction of high performance, 1.8 density foam makes for a lasting comfort story. Our cover application is a high performance fabric that has the weight, luster and look of full top grain leather. If you have any questions about this product by Emerald Home Furnishings, contact us by completing and submitting the form below. If you are looking for a specif part number, please include it with your message.